Eppendorf Reference 2 pipettes, “The New Legend,” are now on sale at Pipette.com. With repetitive strain injuries (RSI) being a common problem in chemical labs, Eppendorf has launched “The New Legend” in ergonomics and high performance pipettes. Eppendorf Reference 2 pipettes are much lighter than its predecessors and benefits those looking for a high performance pipette. The Eppendorf Reference 2 pipettes supplements Pipette.com’s long portfolio of Eppendorf products offering including pipettes, tips, tubes, thermo mixers, shakers and centrifugation equipment. The Eppendorf Reference 2 pipette is special in its one-button operation—a single button can set the volume, perform aspiration, dispensing and ejection of pipette tips. This means lab technicians can reduce thumb movement and avoid the risk of RSI. The Eppendorf name is synonymous with high quality liquid handling products and the release of the Eppendorf Reference 2 pipettes are solid evidence of Eppendorf’s continuous line of innovative products. Hailed as “The New Legend,” its benefits include shorter operation button, quick and secure volume setting, ergonomic handling with the perfect size diameter, and embedded RFID chip containing all relevant data. The outer casing is made of polypropylene and the interior is made of stainless steel, materials that are incredible robust as they can withstand being knocked around. It is resistant to chemicals and solvents and is impervious to heat and pressure. Eppendorf Reference 2 pipettes are incredibly durable and ergonomically designed. Pipette.com distributes over 20 different brand of pipettes, 10 brands of tips, calibrated over 1 a million pipettes, carries comprehensive line of lab equipment and for the past 16 years, have been providing the life science community with tailored solutions to their problems. With the addition of the Eppendorf Reference 2 pipettes, Pipette.com will further enhance their liquid handling solutions for all chemical lab with any pipetting problem. 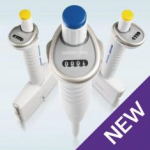 To purchase an Eppendorf Reference 2 pipette or Eppendorf Reference 2 Starter Pack, visit http://pipette.com/eppendorfpipettes?sbr=826&sbn=Eppendorf%20Reference%202%20Pipettes. Questions, concerns and other inquiries can be addressed to the company directly.